I WAS in a garage band once: a band of guys crammed into the dusty garage. Once a week we’d meet up and bang out whatever we could. I’d like to say there was a highly refined aesthetic to our efforts. There wasn’t. The four of us played the only way we could and let the missed cues, bum notes and false starts look after themselves. This is the point where I quote Brian Eno’s line about everyone who bought the first Velvet Underground album forming a band. It’s the sort of tired aphorism that Lou Reed might’ve eventually despised, probably, despite it being – in our case at least – partly true. One of the first songs we rehearsed and recorded was I’m Waiting For The Man. I’m sure we tried Femme Fatale or Sunday Morning at various stages, before attempting our own material. 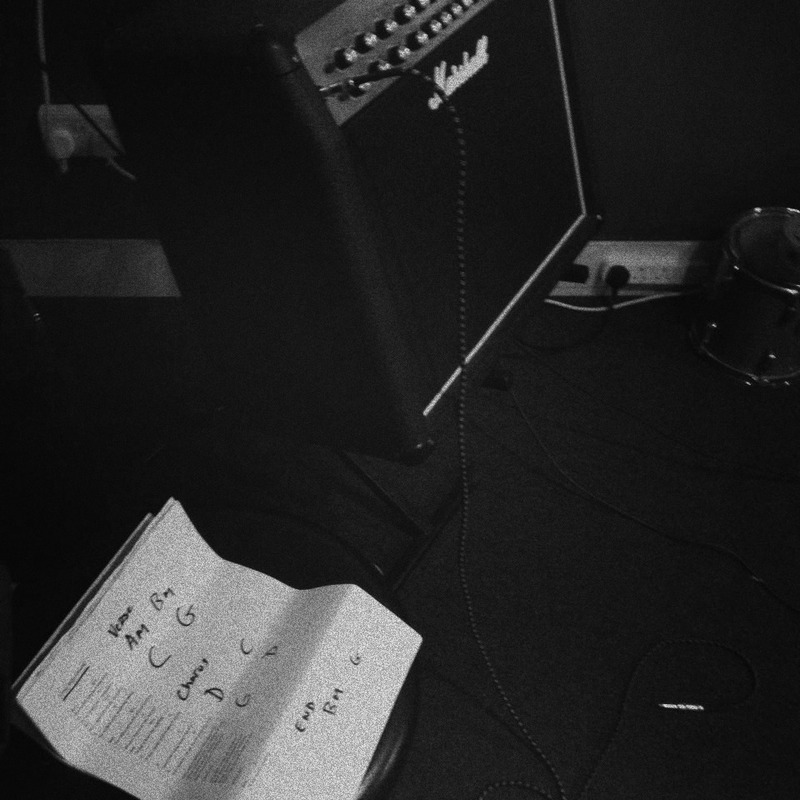 But even after we’d dropped Velvets’ songs from our warm up (we never tried to write like them, strangely enough) Reed’s ‘one chord’ sonic DIY advice remained. 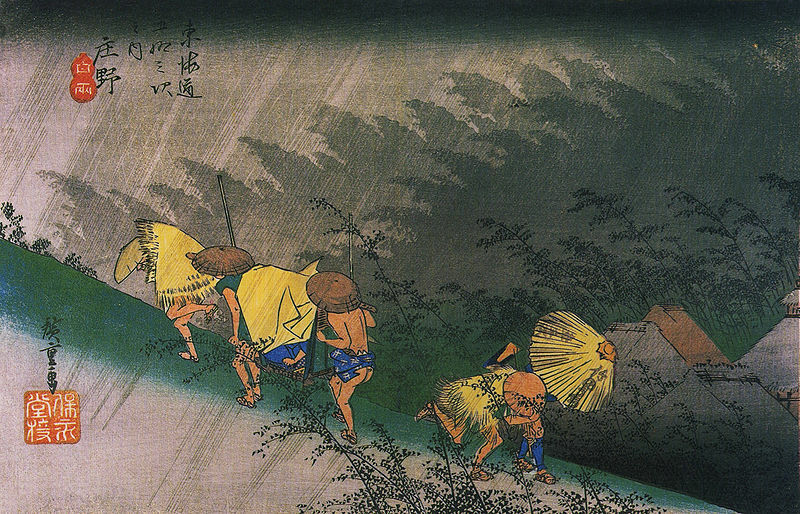 Not least when it came to recording. Idling online on the morning after his death I landed on a track we’d recorded in that garage one winter a decade ago. Reed was all over this effort, in spirit at least. As I remember it the song was cut on a single Sennheiser vocal mike, hung from a roof beam. I think there was a second track for the vocal but I can’t recall (though we certainly mixed something afterwards in ProTools). My main memories are trying to keep enough blood running through my freezing fingers to hit the blink-and-you-miss-it lead solo. We always regarded the recording as rough, about as scuzzed out as anyone’s ears could tolerate. But didn’t White Light/White Heat sound rough as hell too? This was the Lou Reed Effect, for me. Just play it. If it’s raw leave it raw. Listening to Four Miles ten years later I’m glad we applied that. The just-within-our-grasp beat, whatever pedal mix that was, the lo fi drums, even the solo, all sound just dirty and distorted enough to work. 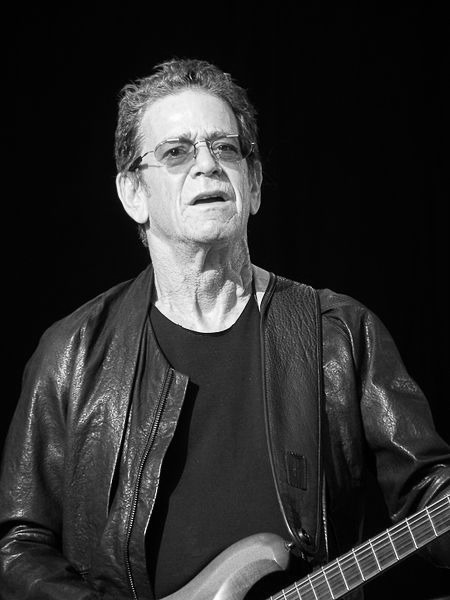 Praise – or blame – Lou Reed for that. RIP. Clogherhead. More fishing than flatbread. How far would you go for a slice of pizza? Eighteen miles across pot-holed country roads in a taxi to a small fishing village perched on the edge of the Irish Sea? That’s where I found myself last Saturday night, clinging to my seatbelt, en route to La Pizzeria in Clogherhead, Co Louth. Clogherhead’s more renowned for fishing that flatbread. It’s also the home of Captain RedMan, a headless sea captain’s ghost who reputedly spends his time wandering the area. If it’s primo Italian cuisine he’s after the RedMan’s in luck – a chef named Jian Carlo has set up there. A local legend on foot of his erstwhile trattoria of the same name in nearby Drogheda (and, er, ‘direct’ customer manner) Jian Carlo opened his new operation in Clogherhead a few months back. 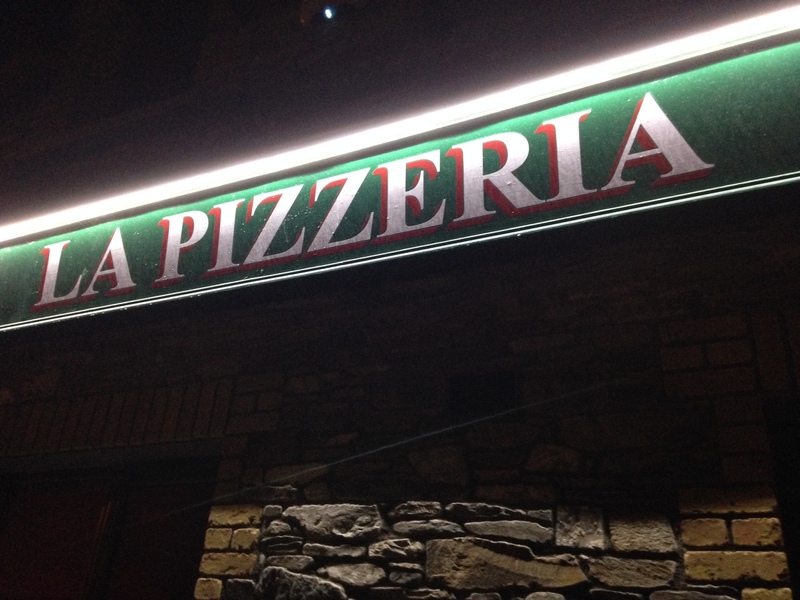 His previous oven produced some of the best pizza I’ve had in Ireland. Eighteen months had passed since we last had a slice there, so my wife and I undertook a pizza pilgrimage last weekend. My frutti di mare – with added anchovies – was very good. Thin, dry crust, less rather than more mozzarella, just enough tuna. Bon anchovy! Jian Carlo’s finest. It wasn’t as I remembered it, though. But that may have had nothing to do with the dish itself. Thinking about it afterwards it occurred to me that memory – the context of place, time, company, weather – influences my palate as much as my tastebuds themselves. A madeleine-dipping Frenchman realised this long before I did, of course. Swapping French biscuits for Italian flatbreads I asked myself: what were my most memorable slices? 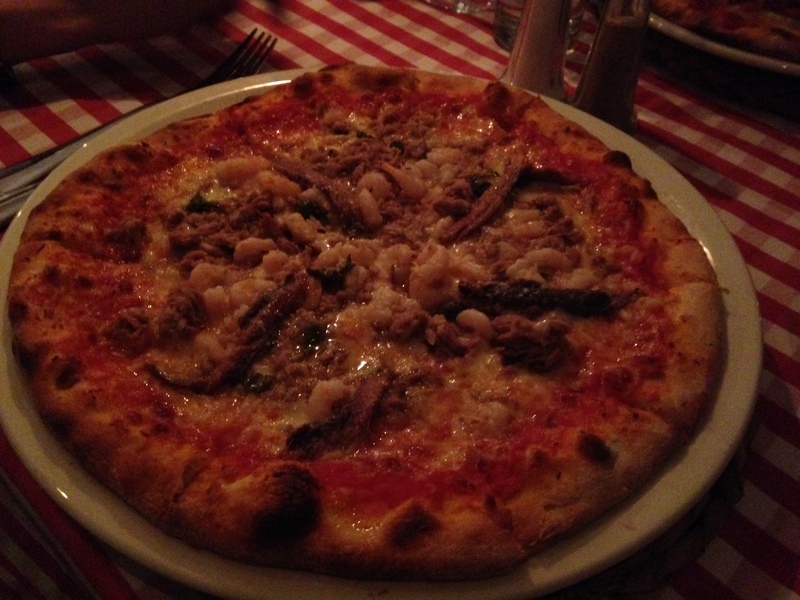 – La Pizzeria (the original): the punch is the base and the crust, which could be eaten with just a slather of sauce. Thankfully Jian Carlos added that tuna, prawns and those anchovies (if you asked). For two years we couldn’t visit Drogheda without eating it. – Pizza Stop: a go-to staple in my single days this alleyway bistro boasted a seafood pizza with the saltiest anchovies (detect a trend here?) of any I’ve had in Dublin. Calamari a go-go too. Capri – no salad. Frutti di mare at Verginiello. – Steps of Rome: back in my 20s this Chatham Street joint sold €2 slices to go, which often fortified my buddies and I on trips from Neary’s to gigs in Whelan’s. I can still taste the crumbly base – I suspect semolina. – Ristorante Verginiello: Capri’s overpriced and blinged up. 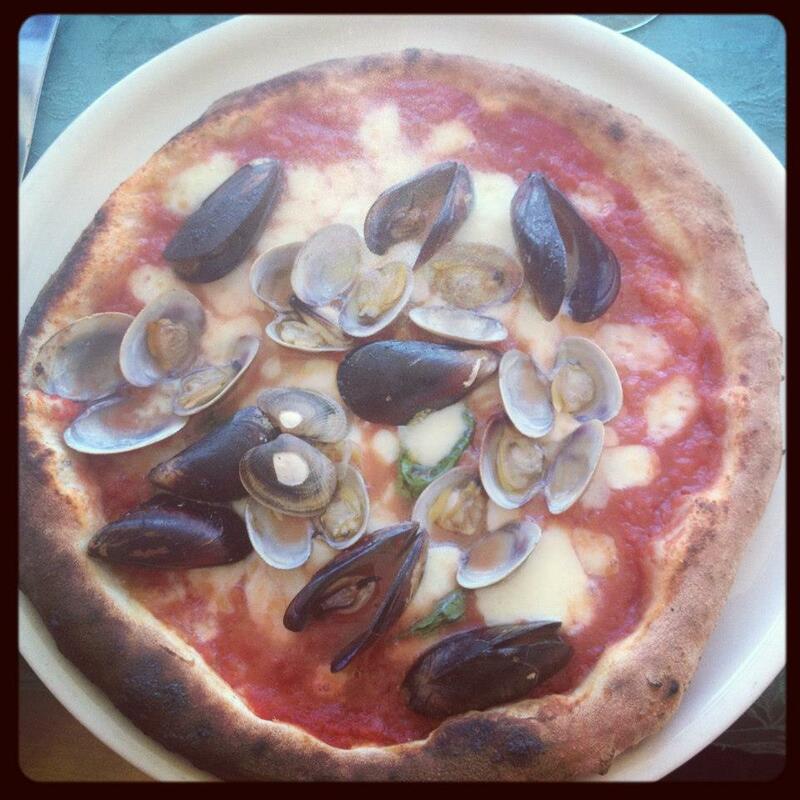 This pizza was neither – I can still taste the mussel juice mixed with the melting cheese. The fact that we tasted it on our honeymoon made it even better. Jackie O, you missed out. – Artichoke Basille’s: on a 2010 work trip to NYC I hit their original East 14th Street outlet. Eschewing meat I opted for a crab slice. Perfect seafood, incredible mozzarella, this was the best pizza I’d ever had. The following day I wrapped up my morning run by breakfasting on another couple of slices. Next time I’m in town it’s a taxi direct from JFK to 14th Street. 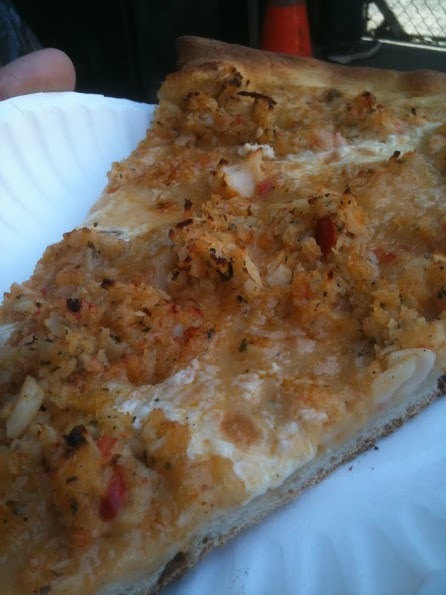 Now that’s a pizza crustacean – Artichoke Basille’s crab slice. 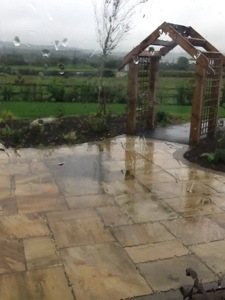 I imagine her always saying ‘I hope the weather holds’. As for the rest, that can look after itself. I just imagine she’s there. Always, in all those places. At peace. 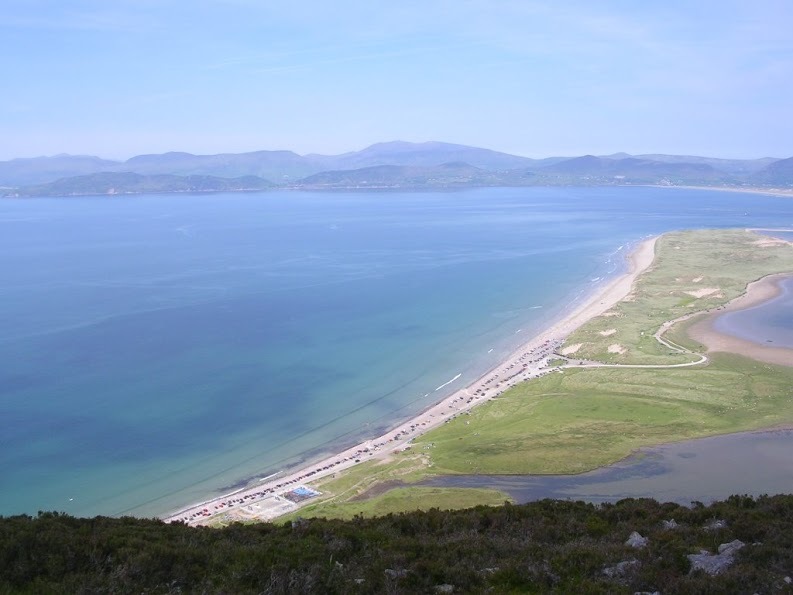 Rossbeigh Strand from Curra Hill, Kerry, June 2009.